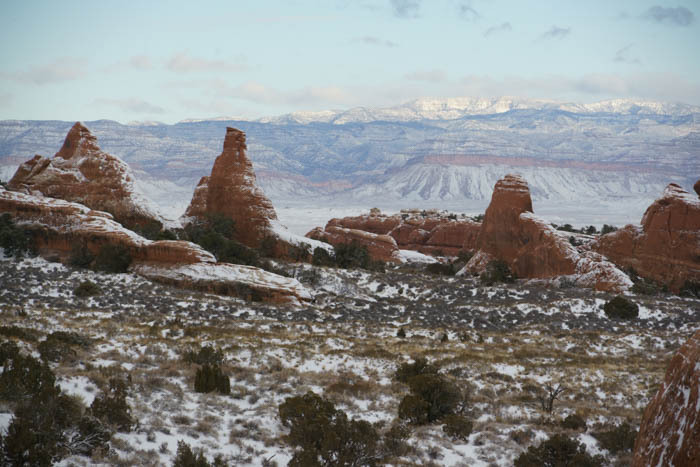 A snowy day in Arches National Park is a rare thing. 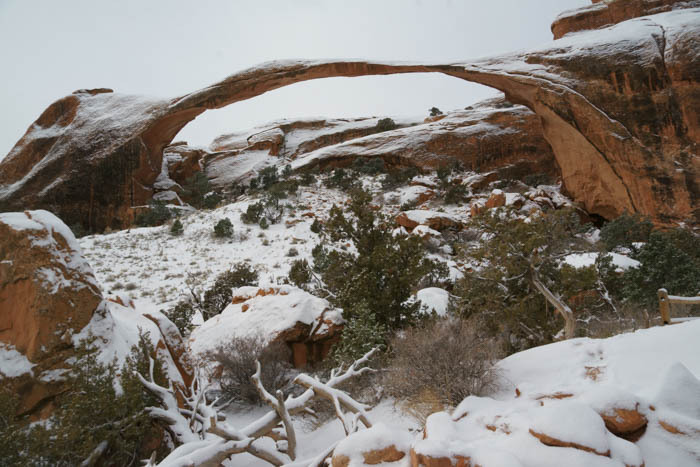 If you happen to be lucky enough to be there when the snow falls, there’s nothing quite like the hike to Landscape Arch in winter. Landscape Arch is located in the Devils Garden area of Arches National Park. From Moab, drive north on US 191 and enter Arches National Park, then drive all the way to the north end of the scenic drive. The trailhead is at the end of the road. I arrived in Arches National Park before dawn. The forecast had predicted two or three hours of snow, right around sunrise, and it was exactly right. I enjoyed a nice drive through the park in the snow while the sky was still dim and blue. You can see that part of my visit on the Arches in Winter page. 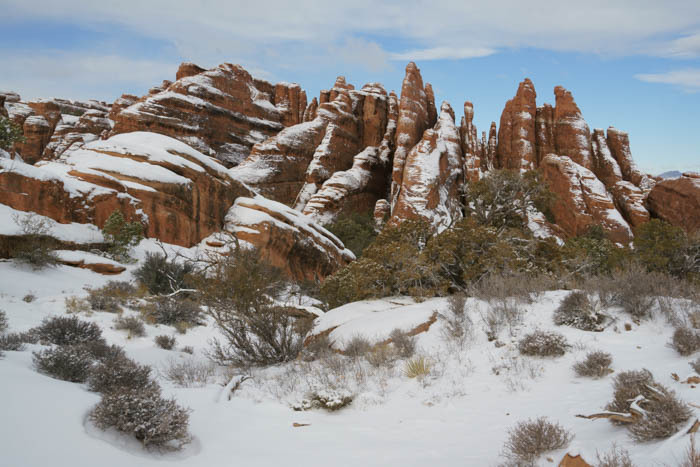 I ended up at the end of the road, at the north end of Arches National Park, at Devils Garden, just as the snow was turning to flurries. 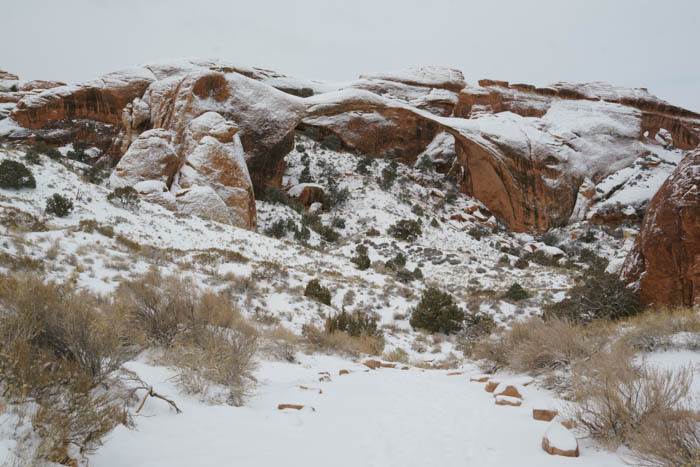 There were only a couple of other cars there, and just a few sets of footprints in the snow, so I knew I’d have the hike to Landscape Arch in winter almost entirely to myself. The hike begins at the trailhead at the end of the road and immediately squeezes between some rocky cliffs and sandstone formations. Everything was nicely frosted with snow, and the sky was still overcast. Silence filled the air. It was hard to believe I was in one of America’s most popular national parks, and I had it all to myself. The hike to Landscape Arch is just part of a longer hike through Devils Garden. It’s about one mile (one way) out to Landscape Arch, and if you hike straight back, you’ll have a two-mile trip. But, Landscape Arch is just one of seven arches (and probably more unnamed ones) along the longer Devils Garden Loop, which involves 7.5 miles of hiking. The other arch mentioned on that sign, Double O Arch, is two miles (one way) from the parking area — although the trail beyond Landscape Arch is more primitive and strenuous. As you get close to Landscape Arch, you probably won’t even see it. The arch blends in with the hill behind it. The trail meanders to a viewpoint that’s pretty close to Landscape arch, allowing you to see some blue sky behind it. Or, in this case, grey sky. 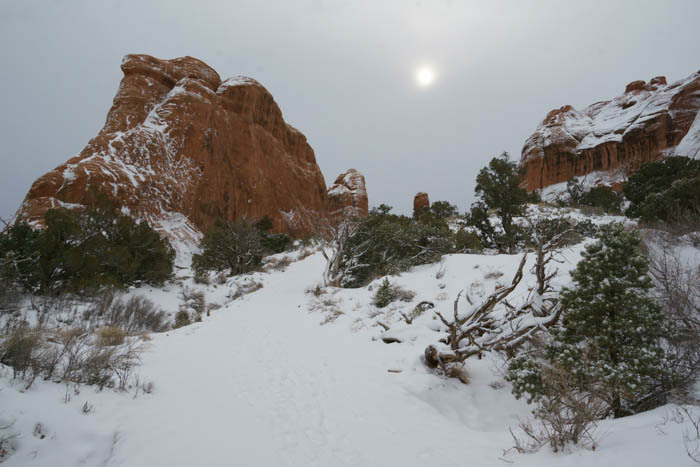 I took a look at the trail that continued on to Double O Arch, and it looked pretty difficult when buried under snow. None of the other footprints continued on up the trail. I decided that I was more interested in a relaxing walk through the snow than a challenging hike uphill. So, I turned around. But, I didn’t head straight back to the car. The Devils Garden Loop trail is more of a lollipop shape, which means there’s a loop at the end. When I reached that split in the trail, I took the turn and headed down the loop for a way. I knew I wasn’t going to hike the whole thing, but the first part of the trail looked easy, and the snow was un-trampled, so I thought I might get some good pictures. While the main part of the trail heads northwest, this part of the trail heads almost due north. That put some interesting rock features directly in front of me, as I headed towards a place called Fin Canyon. As the name suggests, there are plenty of “fins” of sandstone lined up, one after another, and the trail passes by the ends of them. … and this. And as an added bonus, because I was here on a snowy day in winter, everything was frosted with white. Most people never get to see Arches looking like this. Eventually, though, I became aware that I was headed downhill, and that meant that I’d have to regain that elevation once I turned around. My easy, relaxing hike was threatening to become more strenuous once again. So, I chose a random spot, decided it was as far as I’d go, and turned around. And then I saw something I was dreading. The sun. It was starting to break through the clouds. The snow had stopped, and even the random flurries were gone. 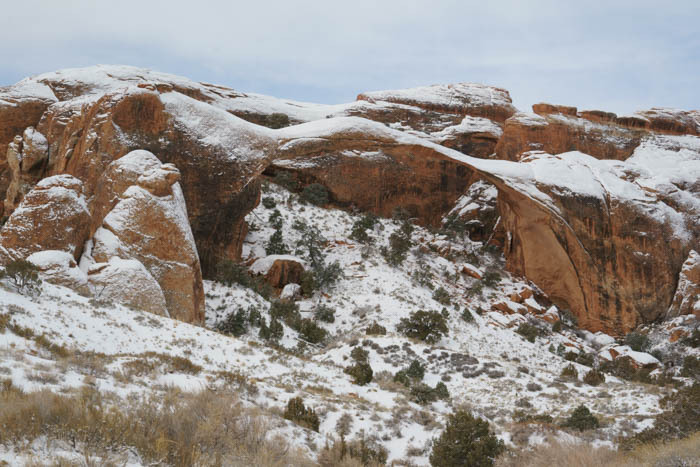 I knew that my hike to Landscape Arch in winter would end up being the snowiest part of my day. Back at the fork in the trail, I caught one more glimpse of Landscape Arch. You can see, the sky was already starting to turn blue behind it. I was going to need to hurry to see as much snow as I could before it started to disappear. 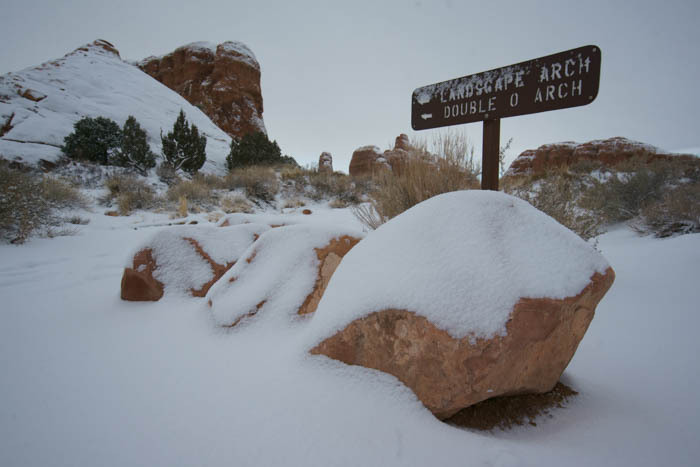 You can check out a previous visit to Landscape Arch (without the snow) here. 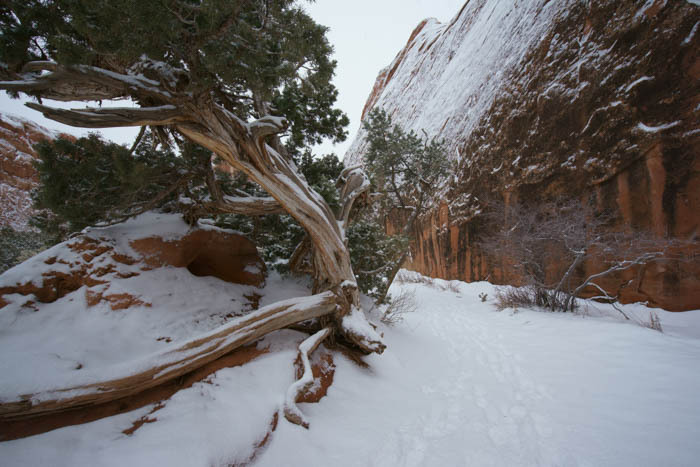 The hike to Landscape Arch in winter is excellent! 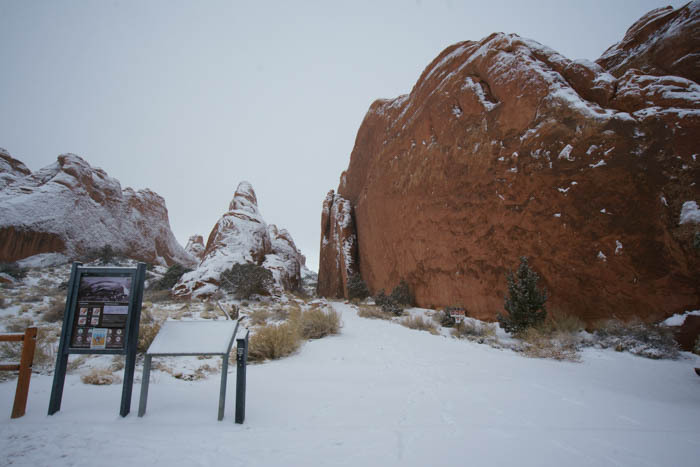 If you’re lucky, you’ll get to enjoy Devils Garden under a fresh coating of snow. 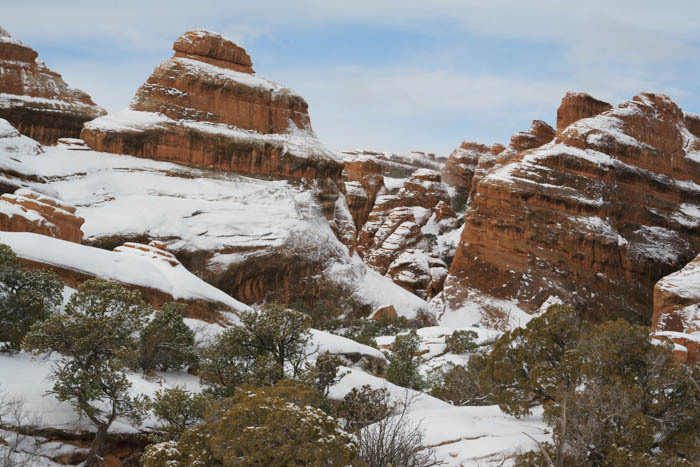 If not, you’ll still get to enjoy a leisurely hike through some beautiful scenery without the oppressive heat and crowds of Arches National Park during the summer months.